S.R. Smith, a world leader in swimming pool deck accessories, offers a versatile water basketball game to complement its entire water sports line. The single-post basketball game is made of stainless-steel tubing that can be mounted into the deck. The backboard, made of high gloss clear plastic, is sized to be effective for a range of ages. The game also has a 5/8-inch heavy-duty solid steel Slam Jam® breakaway rim and a locking anchor. It comes standard with net, ball and needle and is recommended for areas of the pool that do not exceed 42 inches of water depth. Vantage Products International offers its new colored benches and bleachers available in forest green, navy blue, scarlet red and royal blue. The 10-inch-wide seat planks and backs have a uniform, durable, high-quality and attractive finish. All benches and bleachers are backed by a five-year warranty and a 24-hour quick ship guarantee. Aqua GrateTM pultruded grating from Fibergrate Composite Structures, a leader in structural products made of corrosion-resistant FRP (fiberglass-reinforced plastic), is specifically engineered for recreational applications. The fine grit-top surface is highly slip-resistant, and its quarter-inch spacing between bearing bars provides a comfortable walking surface even with bare feet. Its reflective synthetic surfacing veil and UV inhibitors in the resin protect against long-term UV exposure, while its light weight provides easy, inexpensive installation in facilities such as swimming pools, waterparks, marinas and piers. Noncorrosive Aqua GrateTM delivers years of low-cost, low-maintenance service, whether subjected to chlorinated water or salt water. Musson designer tile is a close-nap carpet-like surface of processed rubber-fabric strips made from recycled heavy-duty truck and bus tires, heat-bonded to a flexible "dry-back" adhesive backing. Each natural Earthtone Gray color tile, created especially for heavy-traffic entryways, indoors or out, has a modern geometric design that can be installed placing cut strips into a specific design pattern within each 12-inch-by-12-inch tile. RMT Aquatics (division of RehaMed International) has expanded the lifting capacity of its Splash! HD pool lift to 400 pounds. Recent ADA specifications require public facilities to provide appropriate and unrestricted access to pools and spas for people with disabilities. RMT Aquatics manufactures portable and semi-portable battery-powered Aquatic Lifts that provide safe and effective transfer of individuals with disabilities. Although the minimum lifting capacity specified by the ADA for pool lifts is 300 pounds, RMT has modified its Splash! HD (Heavy Duty) to accommodate users up to 400 pounds, allowing more people to have unrestricted access. Empex Watertoys® presents its new Baby Bungee with ergonomically designed molded plastic seats and a new fiberglass canopy. Often a forgotten participant in splash play areas, babes in arms now have a place to play. The Baby Bungee offers a safe place for parents to put babies so they can bounce up and down amidst the water fun. Completely fabricated from fiberglass and specialty plastics, the Baby Bungee offers a lifetime warranty against corrosion and non-conductivity to lightning. With the Aquatons® product design signature, the Baby Bungee is a great addition, suitable for both beach-entry pools and zero-depth splash play area. 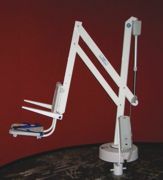 Bradley Corp. offers the new light-powered handwashing fixture. Bradley's patent-pending nditeTM technology converts restroom lighting to energy, which activates the flow of water to its Express® SS and MG series lavatory systems. The Bradley nditeTM technology uses photovoltaic cells integrated into the top of the Express Lavatory System to capture natural light or normal room-level lighting when it is available and store the energy for later use in a battery-free system, eliminating the need for electrical hookups. The handwashing stations are environmentally friendly, eliminate battery replacement costs and help reduce the 2.5 billion pounds of batteries sent to landfills annually. Milnor's new suspended washer-extractors boost washroom production, save overtime costs and conserve floor space because fewer machines are needed. These X-Series models increase productivity through larger cylinders that allow a higher finished wash quality than in other machines. They handle load capacities ranging from 55 to 170 pounds and feature an innovative, two-point inverted suspension system to control vibration and out-of-balance conditions. With a single-speed motor, six speeds permit a variety of fabrics to be processed. The cylinder's large perforated area allows high-quality washing, rinsing and extraction. Pre-programmed wash formulas are easy to select through user-friendly controls.